Have you ever wondered what those sparkly dots up there are? Or rather, do you ever look at them? There’s something to them. They charm us. They feature in poems and songs across the world. We dream of cruising through them. But still, when was the last time you looked at the stars? 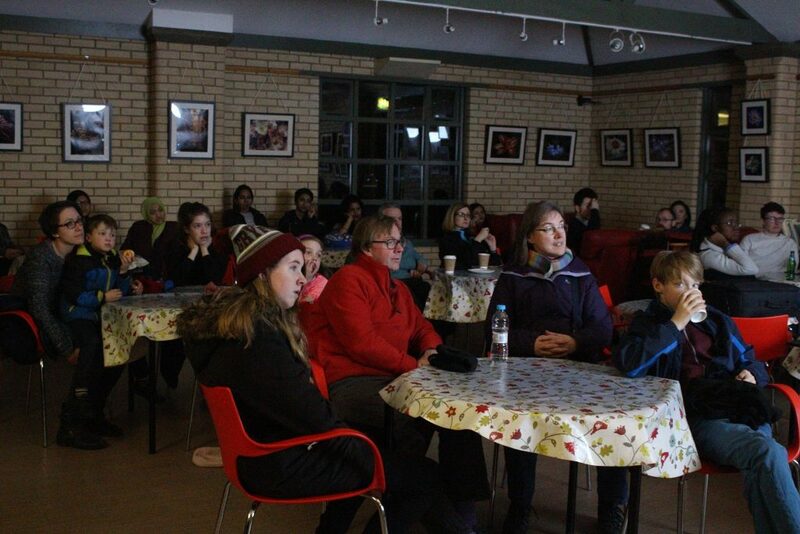 A few weeks ago Café Scientifique teamed up with the Durham Astronomy Society to go stargazing. We met in Fisher House, and walked from there to the Durham Botanic Garden where we looked at the stars. Little by little people arrived, some alone, some with friends, quite a few families with kids. On the way, more people joined our group, and we walked through the darkness of the Botanic Garden together, towards the Garden’s café. In the café, Dr. Jurgen Schmoll talked to us about something that has stuck in my mind ever since: electric light. Have you noticed how when the sun sets we’re flooded by electric lights? There is hardly darkness in the cities anymore. That’s a pity. Don’t get me wrong, I’m not saying we should go back to the dark ages and live by candlelight, but with the proliferation of blue electric lights, looking at the stars becomes nearly impossible without a telescope. When was the last time you saw the Milky Way, if you’ve ever seen it at all? I remember seeing the Milky Way four years ago, from a potato field in Peru. It is, I think, one of the most beautiful things I have ever seen. It may sound corny, but it is true. And I had to go all the way to a Peruvian potato chacra to see it! (Granted, I might have seen it before, but that’s where it was etched into my memory). All because of our overwhelming electric lights. We turn them on and point them at the sky without even realising we’re doing it, and we use way more than we need. Our lights are polluting the night sky, and that is bad not only for stargazing, but also for our sleeping patterns, and for nocturnal animals. Now, one of the reasons we met the day we did was because it was Earth Hour. On Earth Hour, at least theoretically, the people of the world turn off their lights for an hour to give the Earth a break, and to try and make others conscious of the mess we’re making with our energy consumption and uncontrolled illumination. This would be a perfect hour for stargazing, wouldn’t it? Unfortunately some of the nearby colleges forgot to turn off the security lights on the outside of their buildings (yes Collingwood, I’m talking to you). Still, thanks to the telescopes we could take a good look at the stars. Maybe it sounds a bit boring, looking at the stars; but the stars are full of stories. 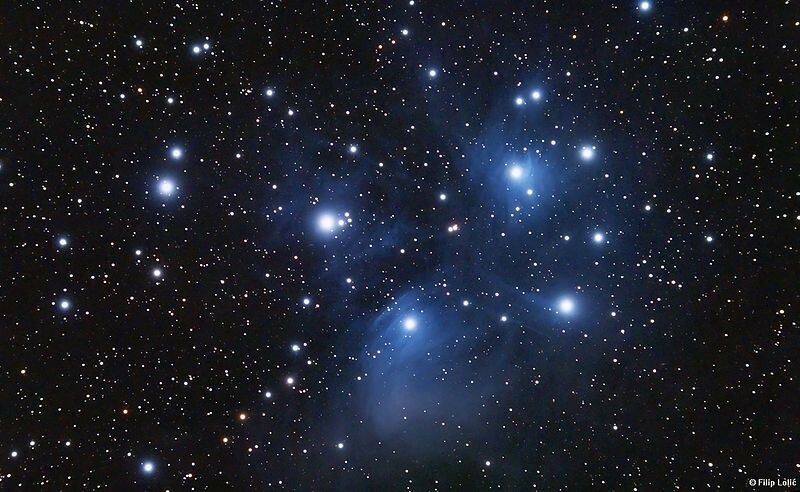 Take the Seven Sisters, also known as the Pleiades; they’re that tiny cluster of stars that look a bit like a little pot or a pan. Only six stars are clearly seen by the naked eye, that’s because –unlike her siblings –the seventh sister loved a mortal man; as a result she gave up her light. Out of shame or out of love? Who knows. When you look at them from a telescope you can see many more than seven stars. What stories lie there? Aiming his bow at the Seven Sisters is the Orion Nebula. This hunter has been chasing the Pleiades for a few thousand years, and apparently he’ll continue to do so for the foreseeable future. As time passed, some stars set and others rose; and like Orion with his bow, we chased them with our telescopes. The night was cold and after a few hours some people started leaving. Jupiter was supposed to rise from behind the trees in the horizon, so some of us stayed to take a look. It was an interesting end to an interesting night: looking at Jupiter’s four Galilean moons –Io, Europa, Ganymede, and Calisto–, and seeing the same thing Galileo must have seen with his telescope all those centuries ago. In the end, like Ernesto Cardenal would say: “We are the star seeing itself. / Born in its fire / and cooled to be able to think and see”. 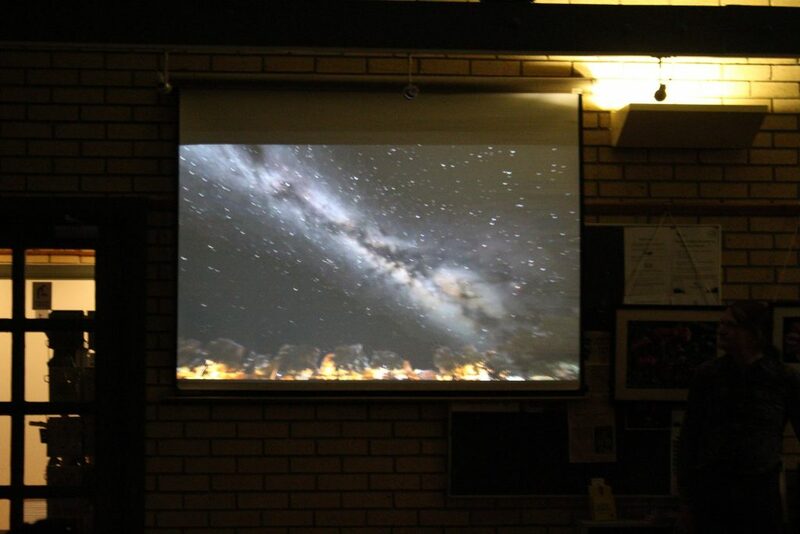 So, why not turn off the electric lights every now and then and try and see the stars? Perhaps from Howlands Farm with all the lights in the parking lot, on the walkways, and on the buildings you might not see much.